Contact us for obtaining superior quality Titanium Pipe Fittings! 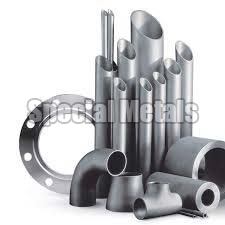 We are a dependable Exporter, Importer and Supplier of Titanium Pipe Fittings in Maharashtra, India. To meet variegated requirements of the buyers, the Titanium Pipe Fittings are offered by us in all forms, shapes and sizes. We are actively offering the Pipe Fittings in grade I & II. Buyers can acquire them from us in bulk and at the modest prices.